The skin is one of the most frequently affected organs by allergic processes. There are several causes for skin allergy, but they all usually present with two characteristics: rash (spots or reddish patches on the skin) and severe itching. Skin allergies are not contagious dermatitis, so there is no problem to share objects or clothing, live or touching the patient's skin. Urticaria is a skin lesion, reddish in plaques and raised, causing intense itching. Urticaria is usually caused by allergic processes may be triggered by medicines, foods, bee sting or contact with substances, such as paints, latex, pollen, animal saliva, etc. Allergic source hives often appear minutes after contact with the allergen (name given to the triggering substance allergy). The fact that you have had prior contact with a substance without ever having presented allergy earlier signs does not mean you can not develop hives after using it. For example, the patient may experience rash after an antibiotic, such as amoxicillin, whether this has previously been used in previous clinical situations. Often, the patient uses a medicament or consume a food for years and of a overnight, shall be present at the same allergy. Urticaria is a typical manifestation of allergy on the skin but it can have a non-allergic origin, being caused by infections, especially viral or bacterial origin. Among the most common causes are flu, colds, urinary tract infection, pharyngitis, mononucleosis, coxsackievirus infection, HIV, etc. The infectious urticaria may occur at any time during the course of infection. In children, 80% of cases of hives are of infectious origin, having nothing to do with allergic processes. The non-allergic urticaria may also arise by physical stimuli such as heat, cold, exercise or pressure on the skin. There are also cases of chronic hives that last longer than 6 months and may not have a clear cause. Angioedema has the same origin of urticaria, but it is a more serious form of allergy, it affects the deeper layers of the skin and also the mucous membranes and may cause swelling of the lips, tongue, eyes and respiratory tract. Angioedema is a dangerous framework that can lead to breathing difficulty due to laryngeal edema or severe asthma, and may progress to anaphylactic shock. Angioedema has a higher risk arise in people with a history of hives, which are reexpostas the substance to which they are allergic. Anyone with hives frame associated with edema of the eyes or the lips should seek medical attention promptly because angioedema can progress to anaphylaxis quickly. Contact dermatitis is a form of skin irritation caused by direct contact of a substance with the same. There are two forms of contact dermatitis. The most common is the one caused by skin contact with irritants naturally. The second form is the skin contact with substances in which the patient is allergic. They are generally substances which do not cause skin reaction for most people, such as latex gloves or detergent. Jewelry (especially those containing metals such as nickel, chromium and cobalt). Thimerosal (old formula of merthiolate). Topical antibiotics, such as bacitracin, neomycin, or silver sulfadiazine. The symptoms of contact dermatitis is a rash, which can both scratch (allergic form), and burning (irritative form). Small blisters and cracked skin may also occur. The contact dermatitis rash tends to be restricted to areas that come into contact with harmful substance. In most cases, dermatitis disappears after a few days if the patient has no more contact with the substance that triggered the rash. Calamine lotion can be used, as it helps to "calm" the skin. In cases of more intense reaction, ointments with corticosteroids may be required. Atopic dermatitis, also named atopic eczema, is a skin lesion, rash type, very common in children, which usually occurs in skin folds, such as the popliteal fossa (back of knee), neck and cubital fossa (part back elbow). In babies, the face is a commonly affected area. The causes of atopic dermatitis are unknown, but is likely to be a combination of dry and irritated skin with immune defects. Psychological stress can aggravate injuries. While accepted for many years now, the relationship between atopic dermatitis and other allergic conditions such as urticaria, asthma and rhinitis have been questioned. In about 85% of cases, atopic dermatitis arises within the first 5 years of life. The rash of atopic dermatitis is an itchy eczema, often with the appearance of scaly, thickened and darkened plates. Atopic eczema is a chronic condition with periods of improvement alternating with phases of worsening rash. About 40% of children no longer have the disease spontaneously when they reach adulthood. In the remaining cases, this dermatitis has no cure, remaining for life. The good news is that there is treatment and it is very effective in controlling eczema. Mosquito bites are common causes of allergy in the skin. Once you are bitten, immediately before sucking our blood, the mosquito injects its saliva, which has anticoagulant action, preventing blood from clotting sucked. It is the mosquito's saliva that usually cause allergic reactions in people. In most cases, the reaction to the sting is small and localized, being the most common symptom of a small increase in reddish skin with intense itching. Symptoms of bites usually occur within 20 minutes and can take up to two days to disappear. The more sensitive a person is to mosquito saliva, longer and more intense is often the reaction to the sting. Some people have a higher sensitivity than normal to mosquito bites, developing a framework called prurigo scrofulous. These are people who, after a single bite, develop various reddish and itchy lesions, as if they had been attacked by several mosquitoes at the same time in different parts of the body. In scrofulous prurigo, injuries can last up to 1 month. Seborrheic dermatitis, also called seborrheic eczema is a common skin disease and it itches a lot. This form of dermatitis is a chronic inflammation that occurs in skin areas that contain large numbers of sebaceous glands. 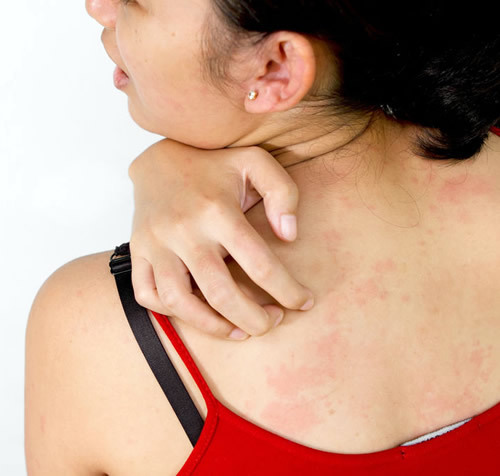 Although look a lot like other dermatitis of allergic origin, rash on plates and itchy, seborrheic dermatitis is not just a skin allergy, although apparently be caused by a reaction of the immune system to the presence of a type of fungus in the skin.